My wife is planning to have several people over to play Dominion next week. We own every set (including Base Cards and 1E Intrigue) so we are planning to set up 3 different tables. A few of the people coming are pretty lightweight when it comes to games, so I want to make sure I don't accidentally set up something that can really turn a game into a slog-fest. Any thoughts on what individual cards or combos should be avoided to meet this objective would be appreciated. Simply play without Attack cards. 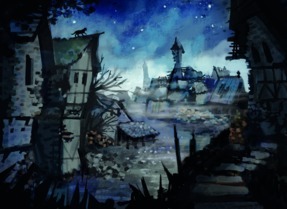 Or more sophisticated, avoid Kingdoms that feature junkers and lack trashers. Even things like Witch are okay as long as there is good trashing. Ghost Ship, on the other hand, is just sloggy no matter what. Avoid that one for sure. I'd also avoid Torturer and Minion. Legionary can be pretty sloggy if someone is able to use it consistently. While it wasn't a classical slog, Fool is the card which has most completely messed up a game for me. Swamp Hag can bring multi-player games to a standstill, especially if there are no gainers: there can be enough Swamp Hags in play at once that nobody wants to buy anything. Mountebank is the epitome of a brutal junker, but I recently played a game in which Jester was almost as bad. People buy the Jester to clone other players' good cards, but play enough of them and everyone's deck turns to treacle, at which point Jester gradually becomes a junker. Avoid any card that requires a lot of shuffling or synchronous shuffling. For example, I have to wait to resolve my Jester until my RHO, who just finished her turn, has shuffled her deck. 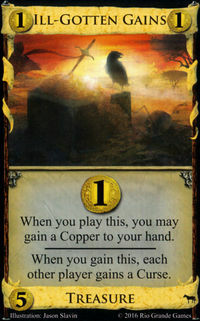 Cards that dig (e.g. Scrying Pool and Hunting Party) are slow to play. Choose a card at random from your right-hand opponent's incompletely shuffled deck. Declare that the top card, resolve Jester, then they can keep shuffling. My RHO doesn't believe that is equivalent, despite my best efforts to convince her otherwise. This clearly needs to not be there. Gardens probably too. Do the guests know Dominion and its expansions well? When playing Dominion with new people I try to avoid introducing lots of complicated cards and mechanics all at once because the amount of time spent reading and digesting what all the cards do adds up quickly. I think playing very slowly because of analysis paralysis tends to be a worse experience than sloggy games where every turn is actually fairly short. I also like only swapping out only two or three cards for new cards when moving on to game 2 rather than generating a whole new kingdom. That way they don't have to keep digesting all new cards every game. Thanks for all the suggestions and good ideas. This is what we ended up doing -- everyone seemed to have a great time and find somewhere they had fun playing. Table 1 was just the base set. This one probably got played the most all night. Possibly because the games were quicker, but I also think because some of the guests were more inexperienced than I had realized they would be. After the initial setup, they would just swap out 0-2 cards between games. For table 2 I set up the Area Control predefined sets for Empires/Adventures (Capital, Catapult/Rocks, Charm, Crown, Farmers' Market, Coin of the Realm, Page, Relic, Treasure Trove, Wine Merchant, Banquet, and Keep). This table was such a draw because most of the experienced players we had over had never played with the newer sets so they all wanted to try it. They were longer games, but everyone who played it loved trying out the new stuff (i.e., Traveller, Split Stack, Event, Land Mark, Tavern Mat). We never modified this table at all. Table 3 was set up so the people who were familiar with the older sets could have more variety, i just had 5 cards each from Intrigue, Seaside, and Prosperity, and then rotated through the three different combinations (i.e., 5 Intrigue + 5 Seaside; then 5 Intrigue + 5 Prosperity; then 5 Seaside + 5 Prosperity). This also worked just fine. Before we started, I had planned on doing entirely different set ups on tables 1 and 2 between games, but I realized that really wasn't necessary. I think if we do this again (and from feedback given, I'm sure we will). I'll just set up 3 tables and then not even mess with them. For those who wanted more variety, I found they just needed to move to a different table. Ultimate lesson learned — Dominion really does have something for everyone. Well, everyone who likes playing deck-building games, anyway. Bonus lesson learned — I had avoided Alchemy (for reasons that can probably be guessed), but quite a few people asked about it specifically — so it's not as unpopular as some might think. Sloggy limited to taking a lot of time? If so, I'd limit "branch actions"/effects that give +2 Actions or more. Every group is indeed different. One group, the new guy won his first game, and fair share of games afterwards because he's a seasoned Magic The Gathering player and managed to recognize card combos and synergies from the get-go. Another group got bored with base game, but their interest piqued when they introduced expansion cards early on.